﻿ Krohn Conservatory at Eden Park - Ohio. Find It Here. Eden Parks Krohn Conservatory is a nationally recognized showcase of more than 3,500 plant species from all over the world. The palm, Tropical, Desert and Orchid houses exhibit permanent displays of exotic plants in natural settings, complete with a 20 foot rainforest waterfall. The Display House features floral shows listed below. The present Conservatory was completed in 1933. The Conservatory, is open every day of the year from 10 :00 AM - 5:00 PM, and extended hours during special shows and events. Krohn Conservatory was named in honor of Irwin M. Krohn, who served on the Board of Park Commissioners from 1912 to 1948. This structure, together with Warder Nursery in Finneytown, replaced the old Eden Park range of greenhouses built in 1902 on the same site. Growing and propagating for the parks is done at Warder Nursery. 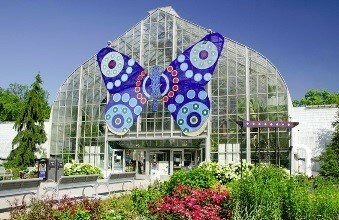 One of the most fascinating and entertaining events held at the Conservatory is the annual Butterfly Show. Countless butterflies are released to fly freely within the Conservatory's showroom, adding yet another blaze of color to an already charming display.